“You are my sunshine, my only sunshine.” This song plays in my mind each time I connect with Myla. As member of UK’s Board of Trustees since 2016, she has been instrumental in leveraging a unified and enthusiastic ENFID. This has led to positive and efficient group dynamics, surely powerful tools in achieving ENFID goals: involving more communities, raising funds for more support to groups and projects and spreading the good name and advocacies of ENFID . As Secretary, she fulfilled her tasks by immediately disseminating meeting minutes, believing that timely information is key to action. She gave significant support to the formation of YENFID and Learning Development programs both in London and Wales along with other leaders. 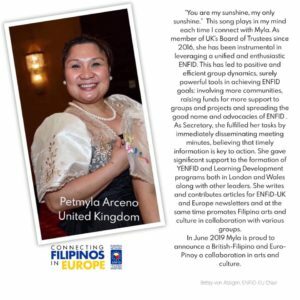 She writes and contributes articles for ENFiD-UK and Europe newsletters and at the same time promotes Filipino arts and culture in collaboration with various groups. 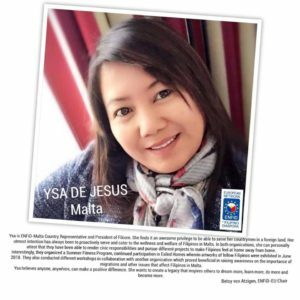 Ysa is ENFiD-Malta Country Representative and President of Filcom. She finds it an awesome privilege to be able to serve her countrymen in a foreign land. 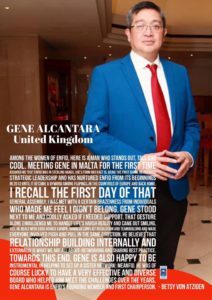 Her utmost intention has always been to proactively serve and cater to the wellness and welfare of Filipinos in Malta. In both organizations, she can personally attest that they have been able to render civic responsibilities and pursue different projects to make Filipinos feel at home away from home. Interestingly, they organized a Summer Fitness Program, continued participation in Exiled Homes wherein artworks of fellow Filipinos were exhibited in June 2018. They also conducted different workshops in collaboration with another organization which proved beneficial in raising awareness on the importance of migrations and other issues that affect Filipinos in Malta. Iceland, known as land of ice and fire, has definitely made it to ENFiD’s map. Maflor is actively engaged in non-profit organization JLKJLU, partner of ENFiD and Akrho Alpha Kappa Rho. One major recipient of this tripartitie is Brosis School for children coming from low or no income families. In December 2017 Maflor and her Team organized a love fest wherein more than 400 kids were dressed in JLKJLU/Brosis School T-shirts, given special goodies and fed during the event. She is very proud that they not only received tangible gifts but experienced the love of Jesus Christ during the event. She has been able to positively impact the lives of these children, its surroundings and even faraway Kenya. Mildred got introduced to ENFiD-Netherlands in a meeting in 2014 which she herself hosted in Roermond. Her interest grew immensely after attending the Prague and Essen Conferences in the last 2 years. Being an elected Country Secretary, she has made efforts to help Kababayans integrate in the same manner she helped other migrants. As a student, Mildred had a reputation for being talkative in class. Her friends still call her Ms. PR or MAJORa and this I knew too well when Mildred was in my class in Assumption High School San Lorenzo. That “special” characteristic of hers is now being used to maximum advantage. Apart from ENFiD, she has also been a Board Member of Help Filipino Children Foundation since 2016. 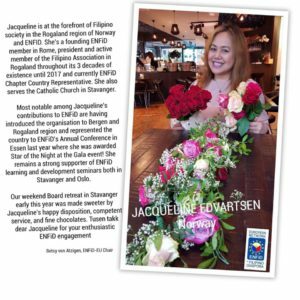 Jacqueline is at the forefront of Filipino society in the Rogaland region of Norway and ENFID. 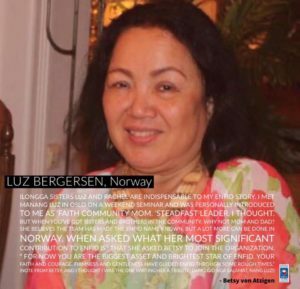 She’s a founding ENFiD member in Rome, president and active member of the Filipino Association in Rogaland throughout its 3 decades of existence until 2017 and currently ENFiD Stavanger Chapter Representative. She also serves the Catholic Church in Stavanger. Most notable among Jacqueline’s contributions to ENFiD are having introduced the organisation to Bergen and Rogaland region and represented the country to ENFiD’s Annual Conference in Essen last year where she was awarded Star of the Night at the Gala event! She remains a strong supporter of ENFiD learning and development seminars both in Stavanger and Oslo. Eppie is a strong supporter of ENFiD advocacy. She was elected Country Representative and everywhere she drove across Switzerland, she introduced ENFiD. Eppie’s strength lies in resource mobilisation for local as well as European events. 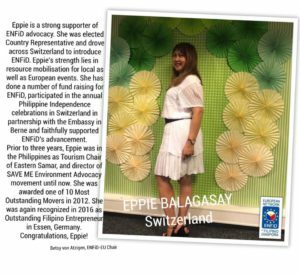 She has done a number of fund raising for ENFiD, participated in the annual Philippine Independence celebrations in Switzerland in partnership with the Embassy in Berne and faithfully supported ENFiD’s advancement. 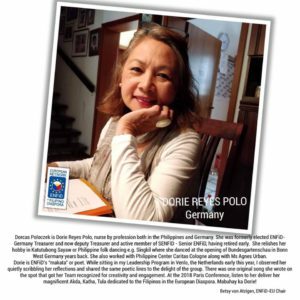 Dorcas Poloczek is Dorie Reyes Polo, nurse by profession both in the Philippines and Germany. She was formerly elected ENFiD-Germany Treasurer and now deputy Treasurer and active member of SENFID – Senior ENFiD, having retired early. She relishes her hobby in Katutubong Sayaw or Philippine folk dancing e.g. Singkil where she danced at the opening of Bundesgartenschau in Bonn West Germany years back. She also worked with Philippine Center Caritas Cologne along with Ms Agnes Urban. Dorie is ENFiD’s “makata” or poet. Chabacana/Ilongga Evelyn Alcarmen Mueschen is Germany’s elected Country Representative. She aims to contribute to the wellbeing of the Filipino Diaspora in her host country. 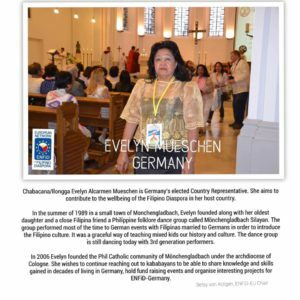 In the summer of 1989 in a small town of Monchengladbach, Evelyn founded along with her oldest daughter and a close Filipina friend a Philippine folklore dance group called Mönchengladbach Silayan. The group performed most of the time to German events with Filipinas married to Germans in order to introduce the Filipino culture. It was a graceful way of teaching mixed kids our history and culture. The dance group is still dancing today with 3rd generation performers. 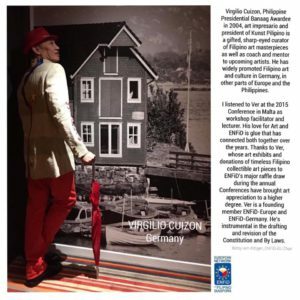 Virgilio Cuizon, Philippine Presidential Banaag Awardee in 2004, art impresario and president of Kunst Pilipino is a gifted, sharp-eyed curator of Filipino art masterpieces as well as coach and mentor to upcoming artists. He has widely promoted Filipino art and culture in Germany, in other parts of Europe and the Philippines. I listened to Ver at the 2015 Conference in Malta as workshop facilitator and lecturer. His love for Art and ENFiD is glue that has connected both together over the years. Thanks to Ver, whose invitation of famed Filipino artists to Europe, art exhibits and donations of timeless Filipino collectible art pieces to ENFiD’s major raffle draw during the annual Conferences have brought art appreciation to a higher degree. Marissa is our money manager @ENFiD-CH. 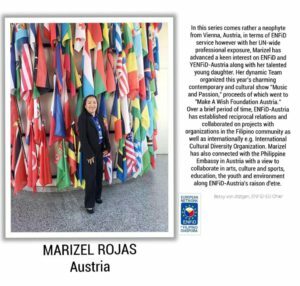 This is the first Filipino civic organization Marissa joined since migrating from the Philippines to Switzerland in 2001. When asked why ENFID? 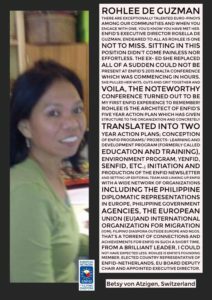 Because she was and is inspired by the objectives and mission of the organisation which is to support the needs and care for the welfare of Filipino migrants in Europe, as the same time reach out to our countrymen in the Philippines through projects and programs. Without hesitation, she committed herself as one of the founding members of ENFiD- Switzerland when it was established in 2015. She believes that taking part in ENFID would allow her to contribute substantially to the care of Filipino migrants in Europe. She became the first elected Treasurer of ENFID-CH and has since ensured all incoming and outgoing transactions are accurately and promptly accounted for. 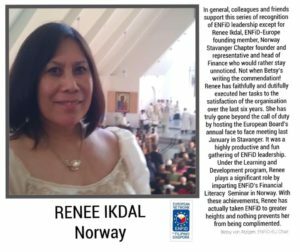 In general, colleagues and friends support this series of recognition of ENFiD leadership except for Renee Ikdal, ENFiD-Europe founding member, Norway Stavanger Chapter founder and representative and head of Finance who would rather stay unnoticed. Not when Betsy’s writing the commendation! Malta was host to ENFiD’s 2015 Conference and Assembly and provided a relaxed, fruitful experience. Crisel finds it so rewarding that her services for ENFiD-Malta as Country Representative between 2015-2017 is being recognized. She is one leader who cares deeply about her community and takes time to reflect on how her Team can strive in a variety of ways to enhance the quality of life away from the homeland through the ENFiD organization. Adelina is dearly beloved Ate Adel to us at ENFiD. Her utmost dream of uniting Filipino communities across UK was realized when she got elected Chair of ENFiD-UK. As Chair, she led various events that made ENFiD known to different communities including Dance Aid UK, “Run for a cause with Josh West, a bus driver who was featured in BBC. When Typhoon Haiyan hit the Philippines, Adel led community leaders and individuals help the British Red Cross collect donations from Underground Stations amidst the winter season. This resulted in a “hug giving” event to the British Community as a way of saying Thank you! Prior to this position, Adel was actively involved in the Filipino-British community as a whole and became a champion in the campaign for the regularisation of domestic workers in the UK by then Prime Minister Tony Blair in 1997. Bonjour! This year’s host of ENFiD Conference and General Assembly is unmistakably Paris, who is unmistakably Dennis, along with his highly committed and enthusiastic French Team! Maayong aga ? Dennis is a founding member of ENFID himself in 2012 and has served the European Board for the full 6 years of its existence. ENFiD-France recently had its foundation with Dennis at the helm. His track record during his leadership tenure speaks of a variety of active engagements in partnership with other organizations, resulting in the highly successful annual Pista sa Paris, integration in society through ongoing French language studies and more for the cause of the Filipino community. Prior to stepping down at the end of 2018, Dennis will have served the European Board as Auditor. 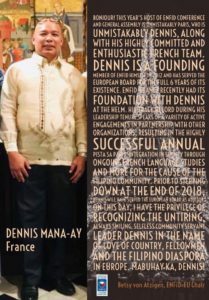 On this day, I have the privilege of recognizing the untiring, always smiling, selfless community servant leader Dennis in the name of love of country, fellowmen and the Filipino Diaspora in Europe. Mabuhay ka, Dennis! ENFiD is thrilled to speak about age for a reason – the launch of SENFiD – Senior ENFiD – at the Paris Conference. The spotlight is indeed gradually shifting from last year’s YENFiD – Young ENFiD – to this year’s SENFiD – the wisest members of the Filipino Diaspora ? 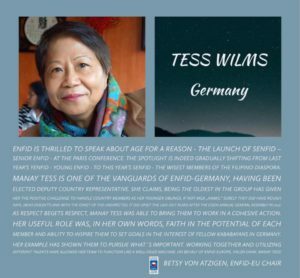 Manay Tess is one of the vanguards of ENFiD-Germany, having been elected Deputy Country Representative. She claims, being the oldest in the group has given her the positive challenge to handle country members as her younger siblings, if not mga „anaks.“ Surely they did have rough days, (who doesn’t?) and with the onset of the unexpected, it did upset the laid-out plans after the Essen Annual General Assembly in 2017. Today’s digital world demands much more from businesses and non-profits alike. Marison’s IT contribution to the founding of ENFiD is therefore crucial. She has been instrumental in digitizing the organization from the start, being a founding member herself in 2012. This meant dedication to ENFiD’s technological needs, apart from taking on the Board Secretary post in 2013-2016, Membership Committee in 2013-2014, Vice-Chair post in 2017 and the Advisory Board this year. The history of ENFiD’s most important document, its Constitution and By Laws bears Marison’s typeprint from drafting to ratification. Back to her Host Country, she founded ENFiD-Czech Republic, helped establish ENFiD-Romania and supported ENFiD-Austria until its foundation day. One other significant achievement worth writing is Marison’s successful hosting of the 2016 Conference and General Assembly in Prague. Hats off to you Mars! Among the 2012 D2D Rome participants and ENFiD founding members is Cheryl. She was first elected Country Representative of ENFiD-Israel in 2013 until 2015. Thereafter she got elected to the EU Board of Directors during the annual Conference in Malta followed by 2017’s re-election to the Board while in Essen, Germany. Cheryl led her Team to deliver and distribute 700 packs of relief goods to Typhoon Nona Victims in Oriental Mindoro in December of 2015; managed a series of feeding programs in different schools affected by Typhoon Nona in Gloria, Oriental Mindoro and has to date continued the feeding program in partnership with Young Professionals of Oriental Mindoro from 2016 in different depressed elementary schools across Oriental Mindoro. I thank and support Cheryl’s engagement of ENFiD-Israel to Europe and look forward to her anchoring of SENFiD (Senior ENFiD) at the coming Paris Conference on the 19th of October 2018. Stars UP IN THE SKY is the picture I see when I think of Leonor. A page is obviously too short for this tribute but suffices to know, she is a luminary in her own right. Since the D2D in Rome when ENFID was born, she has shown loyalty as a founding member in her own words. Leonor has never missed the annual assembly and has been actively supporting the fund-raising for ENFID, either in advertisement or donation. As ENFID Board Member since 2015, she has taken pride in bringing ENFID globally in her power as an Awardee of the Prestigious FWN100 Most Influential Filipina Women in the World in 2015 and 2017. 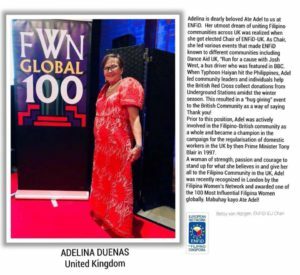 More significantly, in her capacity as Board Director and Chair of FWN Filipina Leadership Global Summit 2018 in London, Leonor introduced the name ENFID – European Network of Filipino Diaspora, its vision, mission, and goals visibly around the globe. She takes pride in being a Board Member of FWN. Having the privilege to nominate two of ENFiD Board Members, namely ENFID Chair, Betsy Jance von Atzigen, and PR Director, Michelle Marquez, who are FWN100 awardees this year, it triples the opportunities to expand global reach and become part of a network of the top and most influential Filipina women business owners and professionals from around the world. Leonor is a Country Representative of ENFiD-Norway and member of ENFiD-EU Board of Directors. The first time I spoke with Edwin face to face at the Philippine Embassy in Prague during ENFiD’s pre-Annual Conference in 2016, I knew he was a tangible answer to my wish to engage more Filipino men in the organisation. Edwin is one admirable, exemplary volunteer leader I’ve worked with in Europe. It was during his term as ENFiD-UK Chair when the organisation received its status as a Registered Charity in the United Kingdom. He introduced Learning and Development (L&D) training such as Basic Life Support, First Aid Training, Psychological First Aid etc not only to UK but also to European countries, having been part of the EU L&D Team. Everyone would agree that indeed Edwin is instrumental in fortifying excellent collaboration among Filipino Organisations, Philippine Embassy and NGOs with ENFiD- UK. Ilongga sisters Luz and Rachel are indispensable to my ENFiD story. I met Manang Luz in Oslo on a weekend seminar and was personally introduced to me as ‘faith community Mom. ‘Steadfast leader, I thought. But when you’ve got sisters and brothers in the community, why not mom and dad? She believes the Team has made the Enfid name known, but a lot more can be done in Norway. Founding members are extraordinary individuals with foresight and courage. They give birth to extraordinary organizations like ENFiD. Rachel is one of them. Present in 2012 in Rome at the GFDC (Global Filipino Diaspora Council) congress, she and Euro-Pinoys present found GFDC too “American” and decided to form a European Council of Filipinos in Diaspora which is now ENFiD. She is instrumental in producing the souvenir program of the 2015 Malta conference as well as inviting Marthy Angue who designed and assisted with all technical needs of the conference. She also solicited a company Mavshack in Sweden, to sponsor 5000 ENFiD tote bags to augment resources. 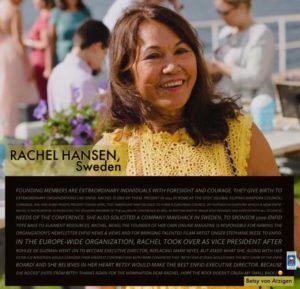 Rachel, being the founder of her own online magazine is responsible for naming the organization’s newsletter Enfid News & Views and for bringing talented FilAm artist singer Stephanie Reese to ENFiD. (Note from Betsy: Thanks again for the nomination dear Rachel. Hope the rock doesn’t crush my small back.) ? Among the women of ENFiD, here is a man who stands out, tall and cool. Meeting Gene in Malta for the first time assured me that ENFiD was in sterling hands. (He’s from UK!) Fact is, being the first Chair, he provided strategic leadership and has nurtured ENFiD from its beginnings in 2012 until it became a byword among Filipinos in the countries of Europe and back home. I recall the first day of that General Assembly, I was met with a certain brazenness from individuals who made me feel I didn’t belong. Gene stood next to me and coolly asked if I needed support. That gesture alone emboldened me to handle life’s harsh reality and came out smiling. Yes, he dealt with egos across Europe, handled conflict resolution and teambuilding and made everyone involved push and pull in the same direction. He believes that relationship building internally and externally is what we are all about: networking and sharing best practice. Towards this end, Gene is also happy to be instrumental in helping to set up a sister network: MEANFiD. He was of course lucky to have a very effective and diverse Board who helped him meet the challenges over the years. Gene Alcantara is ENFiD’s founding member and first Chairperson. There are exceptionally talented Euro-Pinoys among our communities and when you engage with one, you’d know you have met her. ENFiD’s Executive Director Rosella de Guzman, endeared to all as Rohlee is one not to miss. Sitting in this position didn’t come painless nor effortless. The ex-ED she replaced all of a sudden could not be present at ENFiD’s 2015 Malta Conference which was commencing within hours. She pulled her wits, guts and grit together and voila, the noteworthy Conference turned out to be my first ENFiD experience to remember! Rohlee is the architect of ENFiD’s Five Year Action Plan which has given structure to the organization and concretely translated into Two Year Action Plans; conception of ENFiD programs/ projects- Learning and Development Program (formerly called Education and Training), Environment Program, Yenfid, Senfid, etc. ; initiation and production of the ENFiD newsletter and setting up editorial team and linking up ENFiD with a wide network of organizations including the Philippine diplomatic representations in Europe, Philippine government agencies, the European Union (EU)and International Organization for Migration (IOM), Filipino diaspora outside Europe and NGOs. That’s a torrent of connections and achievements for ENFiD in such a short time. From a brilliant leader, I could not have expected less. Rohlee is ENFiD’s founding Member, elected Country Representative of ENFiD-Netherlands, EU Board Deputy Chair and appointed Executive Director. Has anyone met a modern Gabriela Silang? I met one at ENFiD-Switzerland! When I invited Joanna to ENFiD-CH in 2015, she did not expect this community to be such a big organisation across Europe. There she met a lot of leaders in different fields of expertise, learning from them and exchanging ideas. Her biggest challenge was how to balance all other activities she was involved in. But a challenge never puts her down. To borrow a quote, “We don’t grow when things are easy, we grow when we face challenges”. 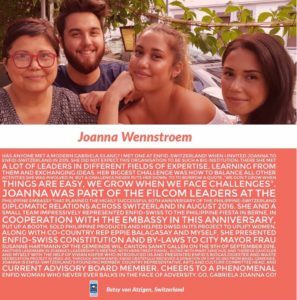 Joanna was part of the Filcom leaders at the Philippine Embassy that planned the highly successful 60th Anniversary of the Philippine-Switzerland Diplomatic Relations across Switzerland in August 2016. 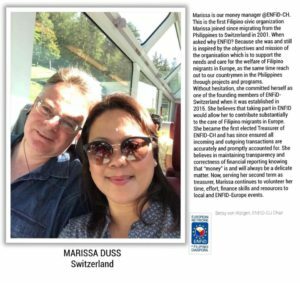 She and a small team impressively represented ENFID-Swiss to the Philippine Fiesta in Berne. In cooperation with the Embassy in this anniversary, she put up a booth, sold Philippine products and helped DWSD in its project to uplift women. Along with Co-Country Rep Eppie Balagasay and Betsy, she presented ENFiD-Swiss Constitution and By-Laws to City Mayor Frau Susanne Hartmann of the Gemeinde Wil, Canton Sankt Gallen on the 9th of September 2016. Another landmark in Joanna’s leadership is meeting with Herr Fredy Dinkel, along with Mary Jane Hug and Theresa Gauckler and again Betsy with the help of Vivian Kiefer who introduced us and presented ENFiD’s BioGAs Digester and Waste Segregation project in Miag-ao, through whom ENFiD-CH gratefully received a donation of CHF 20,000 from Basel Gemeinde. Joanna is ENFiD-Switzerland’s founding member, Country Representative, Arts and Culture Committee Head, and current Advisory Board Member. Cheers to a phenomenal ENFiD woman who never ever balks in the face of adversity. Go, Gabriela Joanna Go! I met indefatigable Pinoy-Dutch ‘Lady Diana’ for the first time at ENFiD Prague Conference in 2016. She is Ilongga like me and therefore the ENFiD connection happened smoothly, made sweeter by piaya and pinasugbo. ? 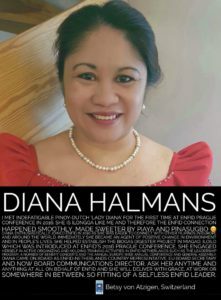 Diana enthusiastically joined ENFiD in 2016 as she was eager to connect with other Filipinos in Europe and around the world. Immediately she became an agent of positive change in environment and in people’s lives. 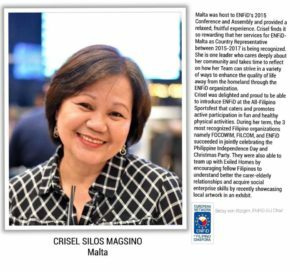 She helped establish the BIOGAS Digester Project in Miagao, Iloilo which was introduced at ENFiD’s 2016 Prague Conference. She engaged herself in active organizing and training activities in ENFiD Netherlands such as the Leadership Program, a number of Benefit Concerts and the annual Europe-wide annual Conference and General Assembly. Diana came on board as ENFiD-Netherlands Country Representative, EU Board Secretary and now Board Communications Director. Ask her anytime and anything at all on behalf of ENFiD and she will deliver with grace, at work or somewhere in between. So fitting of a selfless ENFid leader.